One of the parochial schools that became a public charter school this summer is the Holy Comforter-St. Cyprian School at East Capitol and 14th Streets, SE. Perhaps some Capitol Hill residents were puzzled by the name ‘St. Cyprian,’ since both the church and the school were torn down in the 1960s when the Catholic Diocese combined the congregation with that of Holy Comforter Church and sold both buildings to developer Barrett Linde, who constructed rowhouses on the sites. When institutions are merged and properties demolished, it is sometimes difficult to find a trace of their former existence except for perhaps a plaque marking the spot, some photographs, and individual memories and stories. Indeed there is a plaque in a small triangular park in front of where the handsome stone church once stood at 12th and C Streets, SE. There are undoubtedly many photos of the church, but one of the best—a 1949 photograph of the choir boys in their robes entering the church—is in the Wymer collection at the Washington Historical Society. And many Capitol Hill residents have their own memories of the church, which began in 1893 as an all-black congregation for those who felt less-than-wholly accepted at other neighborhood parishes. St. Cyprian’s School and Convent stood four blocks west of the church, at Eighth and C Streets, SE, across from the Hine School playground. The Atkins family, long associated with St. Cyprian’s Church, gave that land for a Catholic School for black children. 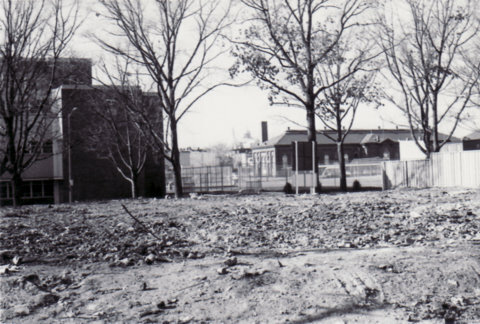 There is no plaque marking the school’s existence, but a magnificent oak tree protected by a low stone wall remains in the alley, behind the 1960s rowhouses, an amazing survivor that sheltered the school and convent. The photographs shown here were taken by Sylvia Cotter, a former Capitol Hill resident, when the building was being demolished in the 1960s. ATKINS: You know about St. Cyprian’s? … It was a lovely church at night. My mother-in-law. She was a big worker in that …the Atkins people did a lot, they put in a lot of money. They gave all to the Blessed Virgin and they gave property for the school. …The Atkins family gave the land for a school for colored children, that didn’t have any, a Catholic school for colored children. They gave the land with their family homestead on it. DRISCOLL: When did they homestead? DRISCOLL: How did the family feel then when the Archdiocese sold it? DRISCOLL: I sure would be…. And there was a wonderful old tree. I don’t know what kind of tree it was, but it was a great big tree in the St. Cyprian courtyard, in back. The complete interview with Helen Atkins can be found at www.capitolhillhistory.org. An interview with Georgiana Barnes by Sharon House, on the same website, tells more of the story of St. Cyprian’s School.